ANDREW GALE praised the patience and consistency of his Yorkshire players as they put themselves into a commanding position against Hampshire at The Ageas Bowl. Steve Patterson fired the visitors to within sight of a possible victory after the hosts collapsed to 54-5 while following on, the Yorkshire captain slicing through the Hampshire top order as he took 3-9 in seven overs. 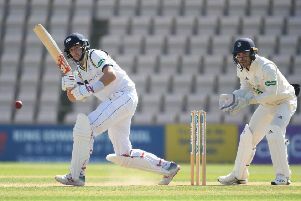 Hampshire were earlier bowled out for 302 in reply to Yorkshire’s 554 and ended the day still 198 runs in arrears. Yorkshire need five wickets on the final day as they aim to follow up their draw against Nottinghamshire last week. “I am really pleased,” said first-team coach Gale. “We knew it was going to be hard work and we had to show lots of patience and consistency. “There were parts where they got partnerships but we knew if we hung in their then we could create chances. There are some tired minds in their dressing room having fielded for so long we thought that if we got one then we could maybe go through them tonight with them in a defensive mindset. “The pitch might be slightly more up and down but it is still a good pitch and there is runs there. Duanne has now hit five guys on the head already this season! He’s an asset to us. He has raw pace, loves bowling and loves hurting people as well I think! “On a slow docile pitch to bowl with that pace is great to see. Patterson has led from the front today. You know what you are going to get from him, he is consistent in every game he plays. Hampshire never got going in a nervy period having been asked to bat again. Joe Weatherley earned a life on one when he guided Duanne Olivier to Harry Brook at gully, but he failed to take advantage of the drop as he nicked Patterson to Kohler-Cadmore at first slip. There are some tired minds in their dressing room having fielded for so long we thought that if we got one then we could maybe go through them tonight with them in a defensive mindset. Fellow opener James Vince followed suit two overs later before Sam Northeast, who had early scored 99, was lbw. Matt Waite joined the party when he had Aiden Markram caught behind and then Kyle Abbott plumb leg before - with Rilee Rossouw and Liam Dawson tip-toeing to stumps. Northeast was the glue throughout the first innings as Hampshire struggled despite a slow and flat wicket and blue skies, which was occasionally blocked by the odd cloud. Nightwatchman Abbott only lasted four morning overs, during which he was hit his elbow, before he ballooned of bat-pad to Harry Brook at short leg. Rossouw joined Northeast and played his natural exuberant game – the pair adding 51 together. But his attacking instincts let him down as he played onto his own stumps while attempting to hoick Mathew Waite through the legside, leaving Hampshire 138-5. But against a softening ball, Northeast and Dawson started to make batting look much easier again. Northeast reached his fifty in 99 balls while Dawson keenly put away the bad balls as he reached an 84-ball half century - the duo put on 109 runs for the sixth wicket. The all-rounder fell for 57 as he attempted to attack Jack Leaning, with Joe Root plucking a catch over his shoulder while back peddling at mid-on. Northeast batted in a determined manner and looked set to reach a third first class hundred in succession – having scored 118 against Oxford MCCU and 169 vs Essex. But having seemingly got stuck in the 90s, having been in the nervous 10 runs before a ton for 14 overs, he edged an excellent Olivier delivery behind. Olivier then came back into the attack and saw off Northeast and Gareth Berg in successive overs, before finding small edges to wicketkeeper Jonny Tattersall. Olivier was giving the Hampshire tail a going over with a barrage of short pitched bowling with some variable bounce causing issues – thrice striking batsmen on the head. Patterson then dispatched McManus and Fidel Edwards in successive balls – both caught at first slip by Kohler-Cadmore – before returning to pile the misery onto Hampshire.